I’ve had countless calls (well, none is countless) saying we’re bored of the brickwork, roof, and random history. 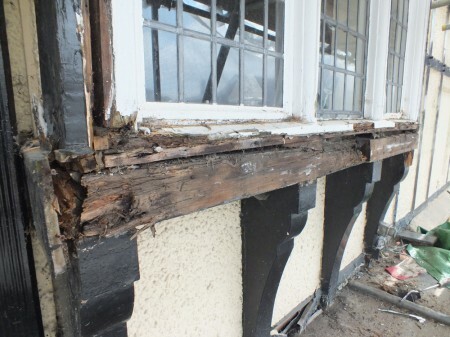 Can we see a bit of timber for a change, and in particular was it a good idea for someone to tidy up the beautiful timber on the first floor bay window by nailing planks of wood to it in such a way that water was directed in but couldn’t get out again? Then for good measure mess up the leadwork to make sure any water travelled behind the gutter. It wasn’t an especially good idea to nail the planks of wood to the bottom of the bay either. The main timbers behind the bay look good, but the window will need to come out to be rebuilt, and the bay window timber frame will need to be rebuilt. I want to keep the window as it matches the grand bay windows on the ground floor, but I’m not sure I’ll be able to keep very much of it. The joinery on the bay window looks fairly straightforward. 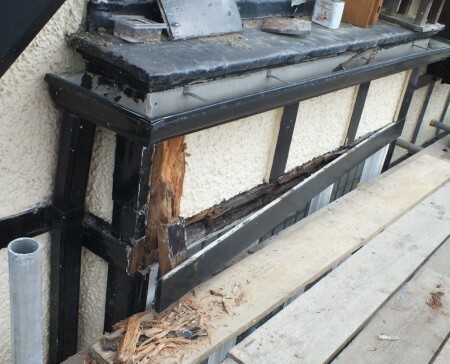 There don’t seem to be any fancy joints, just bits of wood cut and nailed together. 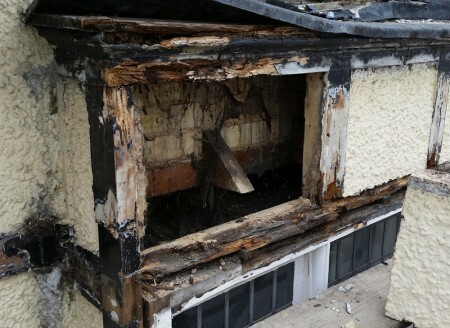 The timber frame holding up the roof behind is fine but the bay will need to be re-made. Some time later we removed the windows for restoration and installed a new bay window frame. This entry was posted in Building on May 27, 2015 by malcolm.